Photo by Henco de Bruijn. 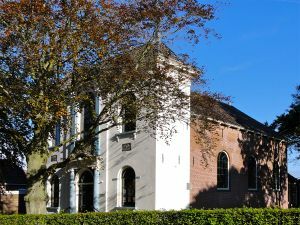 Holwerd, Dutch province of Friesland, is the seat of the congregation of Holwerd-Blija, formerly called Holwerd, de Vischbuurt, and Blija; de Vischbuurt in 1850 became the independent congregation of Ternaard. Until 1935 church services were also held in Blija, but now only in Holwerd. Holwerd is a town of about 2,000 inhabitants. Its Mennonite congregation must have been established about 1563; Leenaert Bouwens baptized a total of 234 persons here (67 in 1563-1565; 167 in 1568-1582). Of the history of this congregation not much is known. A meetinghouse was built in 1629 (this old meetinghouse was still in use in 1930 as a non-Mennonite kindergarten); the membership then numbered about 180; 241 in 1861, 260 in 1900, only 85 in 1954. A new meetinghouse was built in 1850, rebuilt in 1927. An organ was installed in 1906. 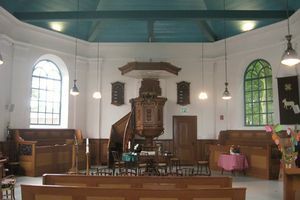 Holwerd was one of the first rural congregations to call a minister trained at the Amsterdam Seminary, viz., Pieter Feenstra, who served here 1792-1797. Since this time the congregation has always been served by a trained minister. Ministers over several decades were A. H. van Drooge 1897-1901, H. C. Barthel 1902-1913, G. A. Hulshoff 1913-1916, W. Hilverda 1916-1950, A. J. van der Linden 1950-1954. Church activities in 1954 included a ladies' circle after 1920; Sunday school for children after 1902; youth group, Menniste Bouwers group. Reliwiki. "Holwerd, Stationsweg 3 - Doopsgezinde Vermaning." 12 July 2013. Web. 12 October 2014. http://reliwiki.nl/index.php/Holwerd,_Stationsweg_3_-_Doopsgezinde_Vermaning. Hilverda, W. and Nanne van der Zijpp. "Holwerd (Friesland, Netherlands)." Global Anabaptist Mennonite Encyclopedia Online. 1954. Web. 26 Apr 2019. http://gameo.org/index.php?title=Holwerd_(Friesland,_Netherlands)&oldid=126160. Hilverda, W. and Nanne van der Zijpp. (1954). Holwerd (Friesland, Netherlands). Global Anabaptist Mennonite Encyclopedia Online. Retrieved 26 April 2019, from http://gameo.org/index.php?title=Holwerd_(Friesland,_Netherlands)&oldid=126160. Adapted by permission of Herald Press, Harrisonburg, Virginia, from Mennonite Encyclopedia, Vol. 2, p. 795. All rights reserved. This page was last modified on 13 October 2014, at 06:50.